According to the 1871 census, almost half the population (48.4 percent) of Ontario and Quebec was listed as being members of the “agricultural class,” and the figures were only slightly smaller in Nova Scotia and New Brunswick. Almost 400,000 of 800,000 men and women to whom an occupation was ascribed came from the agricultural class. (The “professional class,” the source of almost all the Fathers of Confederation, accounted for 4 percent of the population. See the accompanying table for the backgrounds of the Fathers.) The census of 1871 noted only 20 towns of over 5,000 inhabitants, 17 of them in Ontario and Quebec. Only Montreal, Quebec City, and Toronto had over 50,000 inhabitants, and agriculture was never far from even the larger towns. In 1871 there were 172,258 farms in Ontario and 118,086 in Quebec, and the numbers of individual farms increased after that decade in both provinces. Not until 1951 would the number of farms in Ontario drop below the figure for 1871; in Quebec, this process took one decade longer. The men who wrote the British North America Act lived in an agrarian world, and Canada would remain largely agrarian for many decades after. The economic basis of Canadian society was therefore vastly different in 1871 from what it is today. Agriculture and the relatively low population density associated with it held implications for political, cultural, and social life. To make an obvious point, people living on farms would have seen the world differently than today’s Canadian urbanites do. Agriculture, involving a fairly dispersed population, provided the mainstay of the economy and formed the conceptual basis of the political system. The property-owning male father-farmer was an ideal political subject in the 19th century: invested in the land, attentive to the whims of weather and market, yet to a large degree autonomous of the state. Farming, in Jeffersonian thought, served as the basis for a stable republic, and a similar agrarian dream underlay the thoughts of many of the Fathers of Confederation. The farm family reflected virtue and stability, in contrast to the dangers the city posed with its diseases, anonymity, and potential social unrest. Production largely depended on the labour of the family; in the 1860s, farms in the Canadas tended to focus on a mix of field crops and livestock, with some of the produce aimed at external markets. These were not the industrial-scale monoculture farms of the early 21st century. Nor were they the peasant holdings of pre-industrial Europe. Farmers never starved in mid-19th-century British North America — although many may have eked out a difficult existence on marginal soil. By the 1860s, much of the good agricultural land in the Canadas had already been occupied, leading thousands to leave from Canada West for the Red River settlement and much larger numbers to emigrate to the United States, to the chagrin of politicians like George Brown. Meanwhile, others took on waged labour in lumber camps or other resource industries that effectively subsidized marginal family farms. Because of the rural nature of the Canadas, people lived locally, that is, in small-scale settlements. One of the words that appears most frequently throughout the debates is “local.” While this was a code word for “provincial,” it also reflects the smaller-scale vistas of the men in the legislature. (Who in Ontario or Quebec today would refer to Toronto or Quebec City as their “local” government?) Of necessity, to convince the disparate parts of British North America to join in the new country, political elites had to balance the local with the national. This involved weighing the interests of different levels of government, provinces versus the federal government, for a group of men who were ultimately jockeying for power in the new polity, and many of whom distrusted the others. The politicians of the 1860s may have differed on many issues, but they largely embraced a liberal view of the economy, where the state played a limited role, particularly in the redistribution of wealth. The British North America Act, 1867 provided extensive powers to the “local” level of government, while keeping the major tax-raising powers at the level of the central government and leaving municipal powers, the most “local” of all orders of government, to be defined by the provinces. 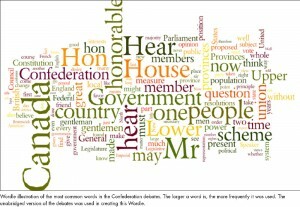 The debaters in 1865 spoke at great length about the composition of the upper chamber, and the powers of the central and provincial governments. But they said little about the level of authority closest to the ground. Municipal and county-level governments were barely mentioned in the debates, and indeed there is still no distinct constitutional basis for municipal governments in Canada. This gap in the debates has consequences today, when the vast majority of Canadians live not only in cities, but in large conurbations. The numbers for 2011 are the exact opposite of 1871: 81 percent of Canadians are urban-dwellers today, while only 19 percent live in rural areas. Nor is the family farm at the centre of Canadian political thought today, with only 650,000 Canadians — 2 percent of the population — living on farms. Yet the future that the politicians of 1865 foresaw involved even more agriculture than existed in 1865, and it implicitly revolved around the image of the family farm. In the Quebec Resolutions, the central and provincial governments were given shared authority over “agriculture,” but the order in which it was listed as a priority is telling: 36th of 37 for the central government, 4th of 18 for the provinces. Agriculture was one of the few areas of shared jurisdiction between the two levels of government, along with immigration, and public works. The collective interest in agriculture related to understandings of potential future development. After all, one way to conceive of Confederation was as a “back-to-the-land” movement, or perhaps more accurately, as a “make-farms” project. Brown saw the great promise of Confederation in opening up the west and north to economic activity, oblivious to any prior claims on that territory. If “Saskatchewan,” a territory he had never seen, could be settled by Euro-Canadian farmers (47), fields and towns would spring up, replacing the boundless forests (54). The settlement of western Canada was a “projet de société”: by attracting European immigrants away from the United States, Brown proclaimed Canada could “develop its great natural resources … and that will endeavor to maintain liberty, and justice, and Christianity throughout the land” (37). Alexander Galt, the member for Sherbrooke and a railway investor, was a bit more financially practical in his assessment: the “valuable mines and fertile lands” in the west offered “additional sources of revenue for government” (32). The creation of Canada, then, would allow business leaders to pursue and expand the same types of economic activities in which the population was already deeply engaged. Railways, another key component of the Confederation deal — how many countries have a clause for railways in their constitution? — could move the farmers’ goods to distant markets. Farmers could export their produce more easily (as they would in fact do in the late 19th century, sending wheat, cheese, pork, beef, and even eggs and livestock in large volumes across the Atlantic, to the United Kingdom in particular). Industries, largely unspecified in the debates, would employ labourers and, presumably, they would transform primary into finished products for local and distant markets. At the same time, “industry” may have equally referred to resource production, such as mining and forestry, in which the raw products tended to be shipped to distant markets, having been only lightly transformed before export. Given the rhythm of much resource production, the family farm was the economic fallback for many male workers, with seasonal waged work in the lumber camps subsidizing a marginal agricultural holding. Well into the 20th century, the dynamics of the country tended to shore up agrarian and rural perspectives. The population in the Prairies grew quickly after 1896, thanks to extremely high levels of immigration from Europe. By 1911, these homesteaders had enabled Saskatchewan to surpass Nova Scotia to become the third-largest province in population, and it would remain in that position until after the devastation of the Great Depression, which revealed that the overexpansion of farming had been a historical error of grand proportions. After the First World War, the federal government attempted to resettle veterans by providing them with access to land, even when it was located in marginal agricultural locations like Vancouver Island. Under the leadership of men like curé Ivanhoé Caron, the Catholic Church encouraged the settlement of the Abitibi district in northern Quebec, while further west, settlers moved into the Peace River district on the border between northern British Columbia and Alberta. By 1936, the three prairie provinces had over 300,000 farms. In the late 1930s, the dangers of reliance on the family farm were readily apparent, and political elites now determined constitutional revisions to be necessary. The Rowell-Sirois commission concluded that new approaches were required to provide security for the Canadian people: the “temporary retreat to the family homestead” could no longer serve as a safety valve for the population. The welfare state emerged largely out of the context of the Second World War, and the Rowell-Sirois commission provided a blueprint. Most strikingly, in 1940, in recognition of the fact that “local” (i.e., provincial) taxes had proved insufficient in dealing with the economic problems of the Great Depression, the British North America Act was amended to allow for the creation of a nationwide unemployment insurance scheme. Colin M. Coates teaches Canadian studies at Glendon College and is the former director of the Robarts Centre for Canadian Studies. Statistics Canada, “Section M: Agriculture,” in Historical Statistics of Canada, catalogue no. 11-516-X, table M12-22, “Farm Holdings, Census Data, Canada and by Province, 1871 to 1971,” http://www.statcan.gc.ca/pub/11-516-x/sectionm/4057754-eng.htm. Statistics Canada, “Highlights,” in Human Activity and the Environment, catalogue no. 16-201-X, http://www.statcan.gc.ca/pub/16-201-x/2014000/aftertoc-aprestdm1-eng.htm.